Three straight years of using Feathr to market Expo! Expo! delivers thousands of conversions and an overall 200x ROI. Promoting the value of events via growth and guidance. The International Association of Exhibitions and Events is the leading association for the global exhibition industry. Representing 10,000 members in 52 countries, IAEE’s mission is to represent the interests of trade show and exposition managers. IAEE’s flagship annual event, Expo! Expo!, brings together event organizers from all over the world to meet, learn, and grow together. 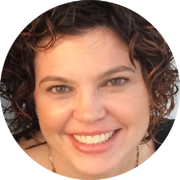 In 2016, IAEE’s VP of Marketing, Nicole Bowman, was looking for a growth solution for Expo! Expo! that wouldn’t add unnecessary complexity or work burden to her team. After meeting Feathr’s young founders, Aidan Augustin and Aleksander Levental, Nicole was intrigued by the platform’s powerful programmatic advertising features and simplicity of use. She decided to use Feathr to promote the value of Expo! Expo! 2016, and the undeniable results inspired her to consistently expand IAEE’s use of Feathr ever since. Click here for an enlightening interview with Nicole about her background and how she gets the job done! A bustling “Campfire Session” at Expo! Expo! 2016. Feathr brought the attendees, but who brought the marshmallows? A late start still netted 124x ROI. After adding the Feathr pixel to the IAEE website, Nicole and her team immediately began segmenting IAEE’s web traffic into targetable categories. Because there wasn’t much time before Expo! Expo! 2016 began, Nicole chose to run two simple retargeting campaigns through Feathr: one for American visitors and one for IAEE’s international audience. Although the budget was tight and the campaigns began only 6 weeks before the show, Feathr’s results exceeded IAEE’s goals for its first use of the platform. The IAEE team was thrilled to report a noteworthy ROI and impressive conversion rate in a restrictively short window of time, not to mention the uptick in attendance. They knew they had found a keeper with Feathr. An example of a banner creative used to promote Expo! Expo! 2016. Feathr retargeting succeeds in driving content downloads. Happy with her results so far and not one to let a successful tool languish until the next event rolled around, Nicole wanted to find out how Feathr fared on a different use case: promoting downloadable content. IAEE provides management services for the Center for Exhibition Industry Research, or CEIR. CEIR publishes several annual reports of trends and data for the exhibitions industry. Like all industry research, CEIR’s data is costly to compile. Nicole’s theory was that Feathr would be equally successful promoting CEIR report downloads as it was driving registrations for Expo! Expo!, especially considering the reports are in the same price range as expo tickets. She had IAEE’s targeted digital audience of event and exhibition pros, and a product she knew was tailored just for them. So she used Feathr to run retargeting campaigns advertising CEIR reports to IAEE’s digital audience. Despite being an unproven use case, Feathr rose to the occasion. The experiment pays off. 62 times over. Feathr campaigns drove a significant boost in CEIR report downloads and demonstrated potential to build equally significant revenue outside of just attendee acquisition. IAEE had their proof. By the end of year one, Nicole, to say the least, was happy with her choice of marketing platform. It had lived up to Aidan and Aleks’s promises. And by the time the CEIR Index campaigns were complete, Nicole and her team had more experience, a better understanding of Feathr’s powerful capabilities, and were ready to tackle Expo! Expo! 2017. A creative used in one of IAEE's 2016 CEIR index campaigns. Feathr’s Customer Success team lives up to its name. Best practices developed by Feathr’s Customer Success team suggest campaigns perform best when they begin 6 months out. In 2017, Nicole and her team had enough pre-show runway and were ready to use all of it for Expo! Expo!. Further following guidelines recommended by the CS team, Nicole ran a combination of “early bird” campaigns, as well as regular rate campaigns with varied messaging targeting nuanced segments of web visitors. Results were spectacular: IAEE’s second year with Feathr did even better than 2016. 7 times better. The success of 2017’s campaigns are a direct result of Nicole’s team having the time and guidance to follow Feathr’s recommended plan. One of the banners from 2017 that helped earn 590x ROI on ad spend. In 2018, IAEE put its partners to work. For 2018, Nicole and her team put together an even more comprehensive plan to promote Expo! Expo! Using Feathr. The Feathr of 2018 boasts even more powerful features than past versions, and as Feathr veterans, Nicole was eager to put them to use. One such feature is the new Feathr Invites. Invites is a tool that enables teams to generate unlimited customized landing pages, email templates, and banner ad creatives to distribute to event partners like exhibitors and speakers. By sharing the custom collateral, event partners promote their participation in the event to their own unique audiences. This broadens event awareness to qualified new audiences and encourages registration from prospective attendees that might otherwise never have known about it. Web traffic from the Invites collateral is trackable by both the Feathr user and the event partners, who each get access to a custom Feathr Partner Dashboard, where they can manage and analyze their own partner campaigns. Feathr leaves it up to the user to choose how to encourage participation among event partners, and Nicole’s Invite incentives for Expo! Expo! 2018 were particularly appealing. She and her team offered booth upgrades to partners who participated and earned conversions through their Invites collateral: 10 registrations earned a silver package upgrade for the 2019 show, 20 earned gold, and 30 earned platinum. 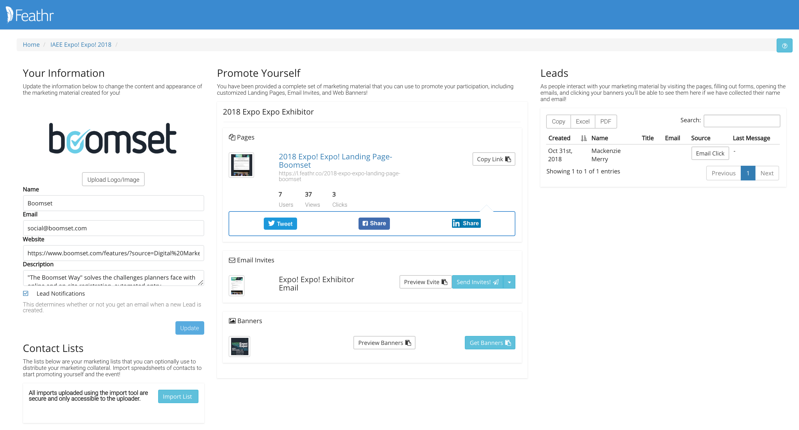 An example of a Feathr Partner Dashboard from Expo! Expo! 2018. Nicole also touts another benefit of Invites. “It’s a form of promotion that does not come from an IAEE voice,” she says, shrewdly identifying a common marketing challenge. Just as consumers tend to trust user reviews more than a company’s own description of their product, prospective attendees are likely to trust a secondary source of information about how valuable an event is, especially coming from a brand they trust. That’s the X factor that makes Invites invaluable. And Nicole’s team—original Feathr power users—understood that value implicitly and used it with surgical precision to earn new attendees for 2018 and secure repeat exhibitors for 2019. New Feathr products open new growth possibilities. Although they were thrilled with Invites, Nicole and her team didn’t forget the tried-and-true Feathr Ad campaigns. Following recommended strategies from Feathr Customer Success Manager Dan Rosato, IAEE ran 4 display campaigns, including an early bird rate campaign, a cart abandonment campaign, a regular rate campaign, and a campaign advertising IAEE’s Hosted Buyer program. It’s too early to publish results for Expo! Expo! 2018, but be sure to come back after December 13, 2018 for an update! IAEE is one of Feathr’s favorite success stories because of its multi-year history, willingness to expand and experiment with new features, and the undeniable cumulative success of its results. “I am a firm believer in ‘no one marketing tactic is the key to success,’” says Nicole about her methods, “but the thing I love about Feathr is it’s the only tool I use that has real, trackable metrics.” Hard to argue with that. A fresh look for 2018's Expo! Expo! campaigns. 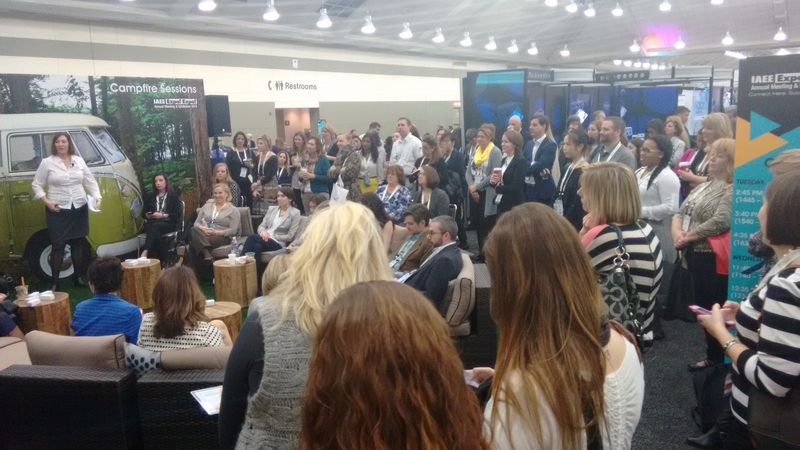 IAEE’s story is ideal for demonstrating the value Feathr offers, not only because it is an undeniable success, but because both organizations are obsessively dedicated to the growth and advocacy of exhibitions, events, and associations. The numbers are impressive, but not unique to just IAEE. Take a look at all the stories on feathr.co/customers to see more success stories just like IAEE’s. Feathr has spent its entire existence developing, testing, and refining tools that are proven to grow events, and we’d like to prove it to you. To learn what Feathr can do for your organization, visit feathr.co/demo and drop us a line today. We can’t wait to hear from you. "I love working with Feathr. When I think about the companies and platforms that help make IAEE’s marketing successful, Feathr is at the top of that list." Book a meeting with a Product Specialist and see for yourself what Feathr can do.